Tiramisu Frozen Coffee – Make your morning coffee even more exciting with a boost from the flavors of tiramisu. Made with double-strength coffee, milk, creamy marscapone cheese, crushed ladyfingers, chocolate syrup, and crushed ice, this tiramisu frozen coffee will transform your morning routine! Coffee has always been a huge part of my life. I can thank my Colombian heritage for that. When my grandmother would visit from Colombia, she would bring me and my sisters these little coffee candies. I was maybe 10 or so and was completely OBSESSED with those candies. So you can say my love affair with coffee started pretty early! Fast-forward to adult life and you can find me enjoying at least one cup hot coffee every morning during the workweek. I cannot function without it; coffee runs my life. Who’s with me??? But on the weekend, I like to jazz up my coffee routine a bit. I have more time on weekend mornings so why not spend a little more time making a fancy, indulgent coffee beverage?! Enter my newest coffee confection: Tiramisu Frozen Coffee. After one sip of this coffee concoction, I was hooked! Super refreshing and slightly sweet from the flavors of tiramisu, this was the best way to spend my Saturday morning. And what’s even better, it’s super simple to assemble! All you have to do is combine double-strength coffee, milk, a little sugar, chocolate syrup, marscapone cheese, ladyfingers, a hint of almond extract, and ice in a blender, blend, and voila! 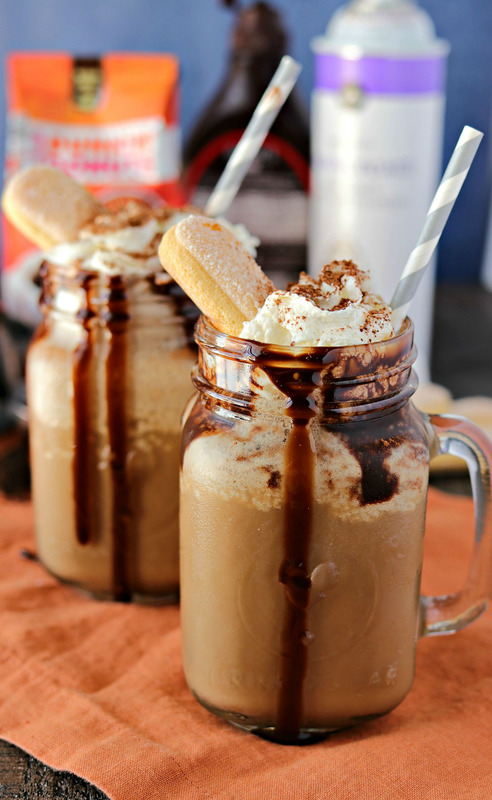 You have yourself a tiramisu frozen coffee in seconds! The almond extract is such a small touch but it’s impact is not hidden whatsoever! I think it gives the drink a special international flavor that suits the rest of the tiramisu elements just right. So trust me when I say that you should not skip out on it! When it comes to the coffee, my husband and I are super snobby about only drinking the best. We’ve both worked in coffee shops at one time or another so we know what great coffee tastes like. That’s why we choose Dunkin’ Donuts® coffee to brew at home. It’s super flavorful and balanced and the perfect addition to our mornings. His favorite is the Dunkin’ Donuts Dark Roast, while my favorite is, to no one’s surprise, the 100% Colombian Roast. As you can see above, we bought the coffee in grounds. But Dunkin’ Donuts coffee is offered in K-Cups and whole beans, too! And in so many other flavors too. You can check out the whole lineup of Dunkin’ Donuts coffee products here. All of these are available at your local Publix, which is where we did our shopping. When you do your Dunkin’ Donuts shopping at Publix through May 6th, you can get $1 off any one (1) Dunkin’ Donuts variety, while supplies last. Before you go, make sure to get your coupon here! It’s very important that you make the coffee double-strength. That means double the amount of grounds but keep the water amount the same. I made this frozen coffee with single and double-strength and the coffee flavor is much more prominent with the double-strength, while the single-strength tastes a little watered-down. I would suggest brewing the coffee the night before you plan to enjoy it so you can chill it in the fridge overnight. But if you decide to make this the morning-of, no worries! I just placed my freshly-brewed coffee in the freezer and it only took about 45 mins- 1 hour to cool it down. Whatever you decide to do, make sure it’s completely cooled down before trying to blend. Otherwise, the coffee will melt the ice before it can blend so it will become liquidy and probably still a little warm. The ladyfingers carry the essence of the tiramisu so don’t make this drink without them! If ladyfingers are a new ingredient to you, you can easily find them at Publix in the cookie aisle. Just make sure to look near the fancy international cookies. Don’t forget to get your toppings for your frozen coffee! We like using whipped cream, a dusting of cocoa powder, and a ladyfinger to top ours. You can also use chocolate shavings or crumbled ladyfingers to top your frozen coffee. Hope you love this Tiramisu Frozen Coffee as much as we do. Because of our mutual coffee obsession, I’m always enjoying my coffee creations with my husband. Who do you enjoy your coffee with? Make your morning coffee even more exciting with a boost from the flavors of tiramisu. Made with double-strength coffee, milk, creamy marscapone cheese, crushed ladyfingers, chocolate syrup, and crushed ice, this magical coffee drink will transform your morning routine! Brew your Dunkin Donuts coffee at double-strength by using 2x the grounds but only 1x of the water. Once it's done brewing, transfer to a container and place in the freezer to cool down. It may take up to an hour to cool it down so plan accordingly. Warning - if you use hot coffee for this drink, it will melt the ice and result in an iced coffee instead of a frozen coffee. Add cold coffee, milk, chocolate syrup, marscapone cheese, ladyfingers, sugar, almond extract, and ice to a blender. Blend on high until completely blended. Drizzle 2 glasses with more chocolate syrup. Pour drinks into glasses. Top with whipped cream and dust with cocoa powder. Place 1/2 ladyfinger on top for garnish. Serve immediately. This looks like heaven in a mason jar! I must make this today! Aw thanks so much! Let me know how you like it! Hi Sharon! I’m tooling around the internet saying hello to other bloggers attending EFC next week. Whaaat? Next week?!?! I’m SO not ready. Tiramisu is my favorite dessert and these look so delicious. Totally worth the sugar crash and burn. Hope to meet you at the conference! Hi Heather! Thanks so much for reaching out! I am super pumped about the conference next. You’re so right – it feels like it sneaked up on me! I hope to meet you there, too! What a great memory of your Grandma to keep close! This drink looks too amazing (meaning that I can’t wait to try it)! What a treat! Along with being a simple delicious looking drink, I LOVE the white coffee mug withe “Coffee” on the front!! Where did you get that??? Aw thanks so much! It’s my favorite mug, actually! I have it in red, as well. I got them from Home Goods and have seen them there each time I’ve visited. You can find them near the other kitchenware and near the check-out queue! My FAV place to shop! Thanks! Oh gosh this looks so decadent! Not only does that look amazing (and adorable) it sounds fantastic! I absolutely love coffee and can’t decide if I would want this as a drink or as a dessert… probably both! Yum! yes, please! these look awesome. Oh my goodness! This looks so refreshing & delicious!! I am not even a fan of coffee, but this looks SO good! I never would have thought of this. I love tiramisu and coffee in desserts so this would be perfect! Thanks so much! That’s the best part about making my own coffee at home – I can get creative! I’ll take both of these, please! They look amazing. I’m pretty sure one of these would cure my 11 a.m. coffee craving. OH MY GOSH!!! This looks absolutely amazing. Definitely going to have to try this ASAP. Thanks for sharing! Oh my gosh…..dessert and coffee, this looks so decadent, I cannot even with this. Have to try. My son used to work at Dunkin Donuts. Of course, this is beside the point. What is the point is how amazing this looks. OMG this is like the ultimate dessert! Looks so good, I love coffee and tiramisu. perfection! This looks so delicious! and so so easy!! Saving for later! So . . . I’ll be making this for sure when the weather warms up here. How yummy! Thanks for the recipe. P.S. The presentation was just as good as the drink looks! I need some mason jars with handles! Haha my husband loves his coffee black too and I only like cream in mine. This drink was perfect for us because we don’t love overly sweet coffee drinks. I think you’re husband will end up liking it too! This looks and sounds amazing. I’ve never made my own frozen coffee!! Thanks so much! So much easier than you imagined, right?? Um…can I come live with you? What a fun twist on a morning cup of coffee! Love it! Haha so happy you love it! Yes, this is a big time jazzed up coffee. My daughter would go crazy for this. Me, I am a one (20oz) cup a day with a little soy creamer and raw sugar. Great post! OH my goodness! What are you doing to me?! It’s not even 7 am yet and here I am having a craving. Looks delicious! Haha it’s a coffee drink so it’s completely acceptable to have this for breakfast!